Lawyers for Boston Marathon bombing suspect Dzhokhar Tsarnaev asked a federal appeals court Wednesday to overturn a judge's decision to not move his upcoming trial out of state. The appeal was filed with the 1st U.S. Circuit Court of Appeals hours after U.S. District Court Judge George O'Toole denied the change-of-venue request and a motion seeking a nine-month delay in the start of the trial. The defense is now asking O'Toole to postpone jury selection, scheduled to begin Monday, pending the outcome of the appeal. Tsarnaev has pleaded not guilty to federal charges connected to the April 2013 explosions at the marathon finish line, which killed three people and injured more than 260. He could face the death penalty if convicted. The defense lawyers, in their appeal to the higher court, again argued Tsarnaev couldn't receive a fair trial in the Boston federal courthouse a couple of miles from where the bombing occurred. Prosecutors, they said, were likely to depict the crimes as having affected not only those killed and injured but nearly the entire greater Boston community. "Thus, every member of the jury pool is, in effect, an actual victim of the charged offenses," the defense attorneys wrote. As an alternative to ordering the trial moved, the lawyers suggested the appeals court order O'Toole to hold a hearing on "disputed issues of fact" and reconsider the previous change-of-venue motions. O'Toole said in his ruling earlier Wednesday he would provide a detailed explanation for it later. 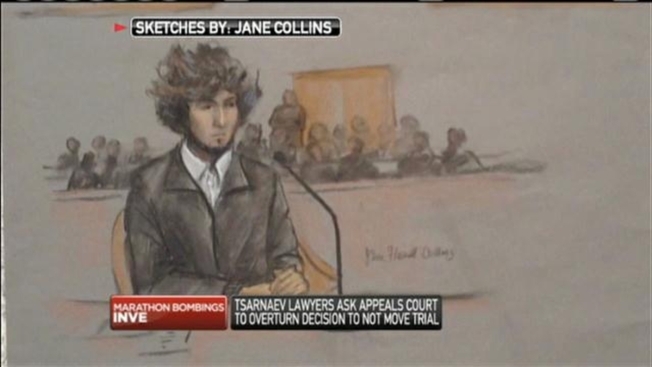 In rejecting Tsarnaev's first request in September to move the trial, O'Toole said defense lawyers had failed to show that extensive pretrial media coverage of the bombings had prejudiced the jury pool to the point an impartial jury couldn't be chosen in Boston. The defense has compared the coverage to that in the case of Oklahoma City bomber Timothy McVeigh, whose trial was moved to Denver. McVeigh was convicted and put to death for the bombing, which killed 168 people. In Wednesday's appeals court filing, Tsarnaev's lawyers noted The Associated Press recently named the aftermath of the marathon bombing the top Massachusetts news story of 2014 and Gov.-elect Charlie Baker, in response to a question posed by The Boston Globe in October, said Tsarnaev was the living person he despised the most. Prosecutors say Tsarnaev, 21, and his older brother, Tamerlan Tsarnaev, planted and detonated two pressure cooker bombs. Tamerlan died following a firefight with police several days after the bombings. Dzhokhar was captured later that day, wounded and hiding in a boat parked in a backyard in suburban Watertown. Also Wednesday, O'Toole issued a decorum order, prohibiting courtroom spectators from wearing clothing, buttons or other items "that carry any message or symbol addressing the issues related to this case that may be or become visible to the jury." The ban includes law enforcement uniforms and badges, except for those worn by on-duty U.S. marshals or court security officers. Defense lawyers said in motions seeking a trial delay the prosecution has not handed over everything they have requested, including information they believe may show Tsarnaev was under his brother's influence. The defense also wanted more time to review information regarding Stephen Silva, who recently pleaded guilty to having possessed the gun prosecutors said the bombing suspects used to kill a Massachusetts Institute of Technology police officer. In a court filing opposing the request for a delay, prosecutors rejected complaints by Tsarnaev's lawyers about their ability to digest the volume of material provided by the government. Prosecutors said much of that information was demanded by the defense and voluntarily turned over by the government "in the spirit of openness."